"Hello! I specialize in flying off the handle unexpectedly." We installed L.A. Noire on Tuesday, but it then took us three hours to download all of the DLC so we didn't actually get to play until Wednesday. Since then, we've been taking it a case or two at a time, when we have the hours, and so we're advancing slowly through the game. Last night we just got promoted from Traffic to Homicide, and haven't started any cases yet on the homicide desk. This is another game that's caused some marital controversy, though not on the order of, say, Portal 2. My spouse wants to play in black & white, and I want to play in color. Right now color's winning, because I put up a bigger fuss. But on the occasional replay (it took us a while to get the hang of questioning witnesses, and then there was that time that I hit what I thought was X and turned out totally not to be) he switches it to black and white, so I get to see both. The interesting thing is, it took that shift in visual tone for me to understand something about L.A. Noire. The game actually suffers from losing the color, and not for any technical reason. Rather, it's that when you're looking at it in shades of grey, it's easier to realize: L.A. Noire is not actually a noir. The overarching story may yet get there, I grant. Flashbacks of Phelps's time in the war, combined with the story unfolding from found newspapers and some other cut-scenes (visiting the singer Else between the end of the last Traffic case and the start of the first Homicide one), are building up into a large secondary tale. We've hours of gameplay ahead of us yet, and we're still early on in our young cop's skyrocketing career. But that's where I get stuck: a film noir isn't about a promising young man's skyrocketing career. It's not about a man's successes at all. Noir is, rather, about a man's critical failures, and the society that made him fall. 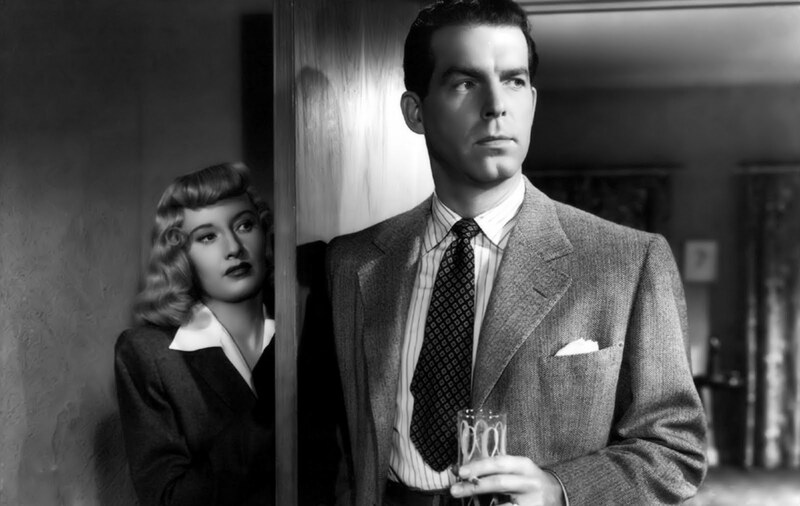 Double Indemnity, 1944 - film noir, as classic as it gets. Go rent it. Like Double Indemnity, these films thrived upon the unvarnished depiction of greed, lust, and cruelty because their basic theme was the depth of human depravity and utterly unheroic nature of human beings -- lessons that were hardly taught but certainly re-emphasized by the unique horrors of World War II. Most of the dark films of the late forties take the form of crime melodramas because ... the mechanisms of crime and criminal detection provide a perfect metaphor for corruption that cuts across conventional moral categories. These films are often set in southern California -- the topographical paradigm for a society in which the gap between expectation and reality is resolved through mass delusion. The protagonists are frequently unsympathetic antiheroes who pursue their base designs or simply drift aimlessly through sinister night worlds of the urban American jungle, but they are just as often decent people caught in traps laid for them by a corrupt social order. In this latter sense, film noir was very much a 'cinema of moral anxiety'' of the sort practiced at various times in postwar Eastern Europe ... i.e., cinema about the conditions of life forced upon honest people in a mendacious, self-deluding society. Here's the other thing, though: what we the modern audience recognize of a noir is its artifice. We recognize the shadows, the blinds, the hats, and the women. We recognize the black and white film and the framing. There's a very specific visual language used to tell these stories, and that visual language conveys crucial elements. The decay of society, the moral ambiguity (or amorality) of the characters, and the literal and metaphorical darkness of the world they inhabit -- we take those lessons from the camera. By now, these artistic tactics are cliché. The audience of 2011 hasn't seen The Naked City, but they've seen thousands of episodes of its modern heir, Law & Order. Our cynicism no longer lurks in shadows, but rather is worn on our sleeves from a very young age. Our society is so inundated with media that most of us start learning to speak the visual language of the camera before we learn to speak our mother tongue. But in a video game, we lose that framing. 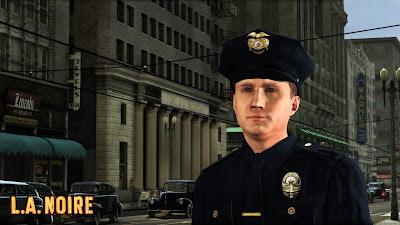 Cole Phelps is a detective, not a shadowy killer, and so much of his work takes place in broad daylight. Shadows are minimal and carefully placed, because otherwise they will interfere with the player's ability to read witness faces and find crucial clues. A game, and especially an investigative process game, must by necessity cede a significant amount of framing and camera control to the player, who maneuvers Cole Phelps at will. I deeply appreciate the use of actual history in the game, but part of what happens when you set a game in such a carefully re-created reality is that you lose the artifice attached to the genre. Film noir isn't about faithfully investigating the crime scene in the California sun; it's about the shadows cast across the face of a disillusioned man, the shadows that allow him to hide his true intentions from a man like Detective Phelps. Cole Phelps is indeed a character type that exists in film noir -- but that character is never the protagonist. The protagonist in a noir is the antihero, the man that has become corrupt from the degeneration of society (and in particular has often been brought low by a degenerate grasping woman). What we are seeing, in L. A. Noire, is a long series of film noir stories in which we are playing the bit part. A case about a scheming B-movie actress, a starry-eyed young girl, and a licentious and immoral film producer? As a two-hour cautionary tale in which people end up dead at the end, that would be a classic noir. But instead we're the cop. We come in after everything's gone all to hell and then reverse engineer the story. Our player character is not in these stories, but rather is an observer of them. As a player avatar, that's a little eerily on target. I look forward to seeing the shape that the game takes by the time we finish it. We may yet find that the story wrapped around all of these cynical little nuggets is, itself, a film noir frame. But even if we don't, I'm enjoying the ride. Interesting. I was about to say that maybe a game can't hit the themes of noir, because the player is too detached to become corrupted as the PoV character. But then I realized that there are at least 3 MMOs that do precisely this. EQ2's Ruins of Kunark had you doing quests that played both sides against each other - killing first one group to gain favor with the other, and then cynically playing the other side of the fence. It had you doing a lot of other nasty things, and it left me feeling kind of dirty. This isn't the visual territory of noir, but it's the emotional territory. Wow's Wrath of the Lich King also led the players, particularly those who played Death Knights, on that path. And Eve Online is notorious for presenting a world where capsuleers have no moral limits on them. Missions often consist of "Go murder person X, because they are costing me money." Or because Daddy's will instructs it. And players do it. I would argue that Heavy Rain succeeds in the way you say, of giving the player an opportunity to become invested in a corrupt player character. Of course, part of it is choice; you can play Jayden or Shelby as well-intentioned types, or as face-punching assholes. But at a certain point the master narrative takes over and the player's dropped into that awkward position. Actually, now that I'm thinking about "what other games do," I'd argue that GTA4 is pretty good about putting the player into a corruptible vessel. I observed that game, rather than playing it, but in the first few hours at least I often pitied Niko, and admired the writing of his descent. Hrmm...so what was your take on "The Man Who Wasn't There"? While noire is evocative of a different time, I think there is a lot that we can recognize in our own political/social situation. It'll be interesting to see if there's a resurgence of it. I think, though, that you've touched upon a problem seen in video games: they'll take a trope of a film genre, but not address how the genre has to be different in the video game media. Like all the games that play on Cold War paranoia. I'd say "Defcon" gets closest to actually doing something with it, and succeeds at being a really harrowing game. genre has to be different in the video game media. Man, I love it when other people realize I'm onto something before I do. (Like, not sarcastically at all, it's a truly fantastic thing about blogging.) You're right! That's it exactly! And now I'm going to write about that next week. Brilliant! Becuase that's kind of it: you can put the same window dressing on, but if you don't address the change in your audience, in their sophistication, and in the era -- you're going to lose the impact. The Uncharted games understand what made Indiana Jones tick, borrowed the right parts, and updated the genre for the 21st century. Less successful games just think the set makes the movie. The game gets considerably murkier as it progresses, both in terms of what you as the player understand about Cole (and his backstory IS the ontological mystery of classic noir, since the player has to discover it, and is never *exactly* sure what happened) and in actual case results. In fact, that's the way LA Noire succeeds MOST as noir -- as a 70s or 90s neo-noir, the story of fundamentally honest human beings who are crushed into corruption not through flaws of their own so much as flaws in the system. The game takes as its models less Double Indemnity and They Drive By Night and more Chinatown and LA Confidential (very obviously). The difference is pretty stark when you compare LA Noire to Dragnet, which shares a number of the game's thematic elements. Sgt. Friday might have not always succeeded, but he always had full faith in himself, his brother officers, and the wider legal system and culture that supported him. I don't think I'm spoiling anything (it comes up in the very first case!) to say that Cole Phelps doesn't share that same belief, and isn't ALLOWED to share that belief. The game is one long struggle to stay honest in the face of overwhelming adversity, or, as you quoted, "the conditions of life forced upon honest people in a mendacious, self-deluding society." So, first off, I have played the entire game, so there's a lot I can't talk about without spoiling it. I will just stick to general thematic stuff. I completely agree that L.A. Noire is not a film noir in video-game format, for all the artistic reasons you give. However, I don't think that is what the game developers were trying to accomplish (title notwithstanding). Maybe it is just that I know more about history than film, but for me, the game plays like historical fiction. It draws on noir themes (as well as hard-boiled detective literature and war movies) to explore a particular time and place in American history, but the historical stuff is primary. The game is very much in the same vein as last year's Red Dead Redemption, which drew on Western film tropes to explore an earlier historical period. Another, disconnected, thought: your statement about Cole Phelps being a spectator in other peoples' noir stories is astute, and made a light go on for me regarding one of the developments towards the end of the game. I now understand better what the point of it was, so thanks! My first thought on reading this is that its not axiomatically the case that everyone's touchstone for noir is giong to be the Film Noir of the 50s; certainly when you start talking about noir with me, my mind goes immediately to Phillip Marlowe and _The Long Goodbye_ rather than, say "Double Indemnity". I haven't been able to play LA Noir yet, since I refuse to in any way compromise my 25 year love affair with PC gaming (other, normal, people look back with fondness on hours with Zelda. I look back that way on the original 8-bit Harpoon) but the conception of the Noir hero as an implicitly corrupt strikes me --that is, someone who's conception of the genre come through the literary rather than film world-- as almost 180 degree's off kilter. This may be a bit too one side, but while I don't have any quarrel with the "neo" in "Neo-Noir", I push back pretty hard against the idea that those works are entirely and necessarily responding to the film's of the 50's and 60's. I think its at least as plausible and as useful to understand both as separate, inter-related decedents of the same ancestor. Veronica Mars is almost palpably a Philip Marlowe analog, for example. The more I think about it, the more it seems to me that most of the television examples of noir follow the literary model, rather than the film one. Which probably has as much to do with the constraints of television as anything; TV needs a hero who isn't destroyed by their own venality at the end of the pilot. The other thought that I had, back when this was a coherent reply and not vague rambling, was that I there seems to me to be a risk of thinking of games as more like film, or even television than they actually are. Its a natural fit, because so much of the visual styling is lifted directly from film, but if nothing else, even a very short game would make for a very, very long film. And something like a BioWare product amounts to 40 or more hours of content, which means even a very tightly passed narrative game is going to feel very slow compared to a film. I'm referring mostly to the assumption of film as the antecedents, fwiw. the question is "Are these people as smart as they think they are?" And the answer, of course, is "no." In the original noir, in the world of Marlowe, the protagonist is far from clean. He (always he) probably ought not to be called a hero. But he isn't corrupt. The one code that all early noir protagonists have is to not take anything they didn't earn. It's how they survive in the one-against-all and all-against-all world. It's absolutely true that games and films are different beasts -- but L.A. Noire specifically invites heavy comparisons with its design. The "noir" is right there in the title and the setting of 1947 Los Angeles is extremely deliberately chosen and re-created. The trappings of noir are there, and the facade -- with a number of these cases, you are meant to look at them and have the films that came before spring to mind. It's intentional. With a number of other games, the tools of film are still in play (for cut-scenes, all film rules apply; for player-interactive sequences, some still do, particularly with regards to framing, lighting, and sound) but, as you say -- are comparisons to be careful of. Bioshock and Mass Effect, for example, use film conventions very well to enhance the uniquely gaming-based stories that they're telling. The point about neo-noir is well taken, but a straight-up post-1970 cynical take on the genre would / does feel equally misplaced in a carefully built 1947. It's a delicate line, understanding the audience's background knowledge and sophistication without being actively disruptive to the setting they've chosen. I'm going to have to get further in to see if it succeeds. The actual cases themselves are adapted Law & Order style from historical records, aren't they? The game definitely draws more heavily from the psuedo-documentary style such as Fox was the big player. 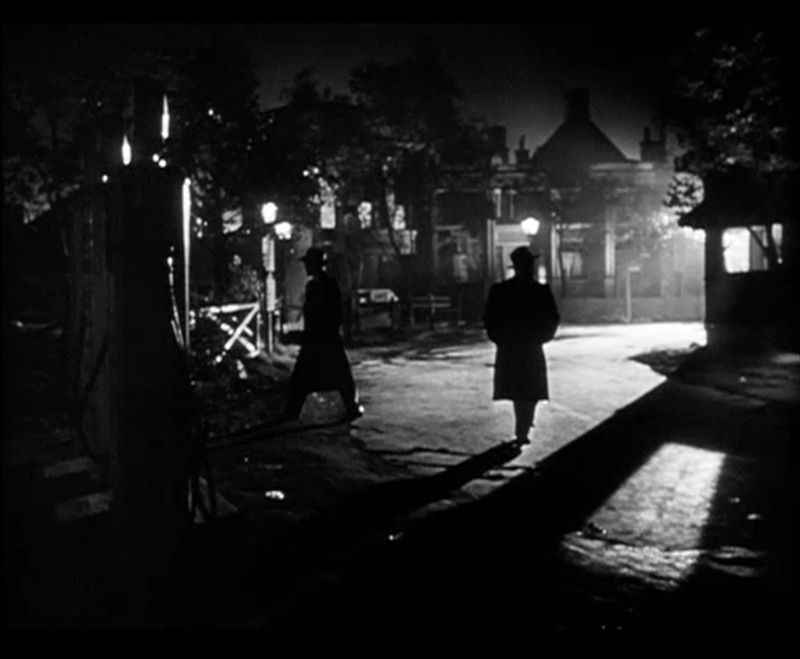 Films like He Walked by Night, T-Men, henry hathaway. the biggest one early on in the game seems to me to be the Naked City, although the setting is different yet so key to both film and game.